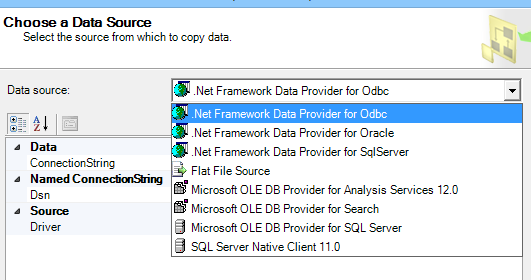 SQL 2014 – Eureka! I have found it! Is Excel Missing from Import and Export Data? Recently, a user was trying to import some data from a Microsoft Excel file using the Import and Export Data wizard. The dropdown choices did not Excel as an option, but they know they had used it in the past. The reason for this is that they were running the 64-bit wizard. Since there is no 64-bit version of the Excel driver, it wasn’t on the list. Running the 32-bit version provided the data sources they were expecting. In our case, we are running SQL 2012, but we’ve installed the SQL 2014 tools in order to use the latest SSMS. By default the 64-bit SQL Server 2014 Import and Export Data is located at C:\Program Files\Microsoft SQL Server\120\DTS\Binn\DTSWizard.exe.